Rejuvenating the eyelid with surgery is very popular in the United States and around the world. If you are unhappy with the way your eye area has aged, our board-certified plastic surgeons at Inspire Cosmetic Surgery & Med Spa can help ease the look of your tired and aged appearance with cosmetic eyelid surgery. In our office in Delray Beach, FL we offer upper and/or lower eyelid surgery (also called blepharoplasty) as an outpatient procedure. To enhance the upper eyelid, we can provide relief from the common problems with aging skin in this area such as excessive skin (hooding) and puffiness caused by herniation of fat. Our skilled plastic surgeons can delicately change the shape, position, and depth of your eyelid crease. We also see patients who need upper eyelid surgery to improve vision. Lower eyelid surgery removes the "bags" or puffiness of the lower lid. "What an amazing team!! Dr. Goodwin, Kathy and Angela made a very stressful life event involving my double mastectomy and reconstruction turn from a nightmare into a dream. Very supportive with great bedside manner. This truly talented surgeon has your best interests in mind always." "I wanted to share my outstanding experience regarding my recent reconstructive surgery. In addition to being a highly credentialed, phenomenal doctor who has enabled me to feel proud of my body again, he is a wonderful person. Compassionate, caring, & always willing to listen, Dr. Goodwin's bedside manner is unparalleled. Despite my countless questions, I never once felt rushed during any of my appointments & he always answered me with kindness, patience, & sensitivity." "Buccal Fat Removal Success - No pain at all. No scars at all. Lost some weight do to not being able to eat much. Stuck with mash potatoes, Lipton soup, redefine beans from Taco Bell and ice cream. Drank protein drinks aswell. I would recommend this to anyone wanting to enhance there cheeks bones or contours there face. I had gotten cheek filler once before but after removing the buccal fat my cheeks looked so good I..."
"It was a great experience at inspire. They have wonderful specials on facial products and procedures . Katie is the practitioner and is very patient and knowledgeable . I have told all my friends about it!" "I really love Inspire! I have been going there for a couple years now for Botox and I am never disappointed. I recently decided to get Volbella with Katie and I am extremely pleased. She was able to perfectly execute what I was looking for! The clinical staff are all true perfectionists.The entire office staff is always very warm and welcoming as well. Can’t say enough positive stuff about them!" Healthy adults with droopy upper eyelids or puffy bags under the eyes are generally the best candidates for this procedure. Blepharoplasty can be performed on the upper eyelid, lower eyelid, or both under local anesthesia, IV sedation, or general anesthesia. This procedure is most commonly used to treat excess, loose, and sagging skin around the eyes that can impair vision and make a patient look and feel tired. This procedure also corrects minor wrinkles and folds around the eyes to improve your appearance. During the procedure, the loose skin around the eye is removed along with any fat pockets through small incisions. At your private consultation, we will discuss in depth the surgical technique and all of the surgery details as it pertains to your specific case. 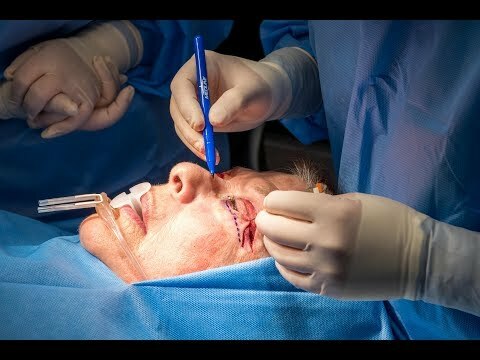 Following eyelid surgery, patients should keep their head elevated for the first several days. Bruising and swelling should be expected and may last up to 3 – 4 weeks. Your surgery results will look their best once the treatment area has healed in 3 – 4 weeks. Patients should expect minimal scarring at incision points, which will be almost invisible to the naked eye. Eyelid surgery can help to improve your eyes by making you look more attractive and improving your vision. Many patients, both men, and women undergo blepharoplasty to rejuvenate their appearance and improve the physical ailments that come from loose, sagging skin around the eyes. For women, this loose skin can make putting on makeup a burden and may prevent them from achieving the look they desire. If you are considering eyelid surgery schedule a consultation at our office to begin the journey toward your rejuvenated look.